This August Chance Waters is celebrating his recent success with his Maybe Tomorrow Tour. Chance will play a string of dates along the east coast throughout August following the success of the recent single Maybe Tomorrow. 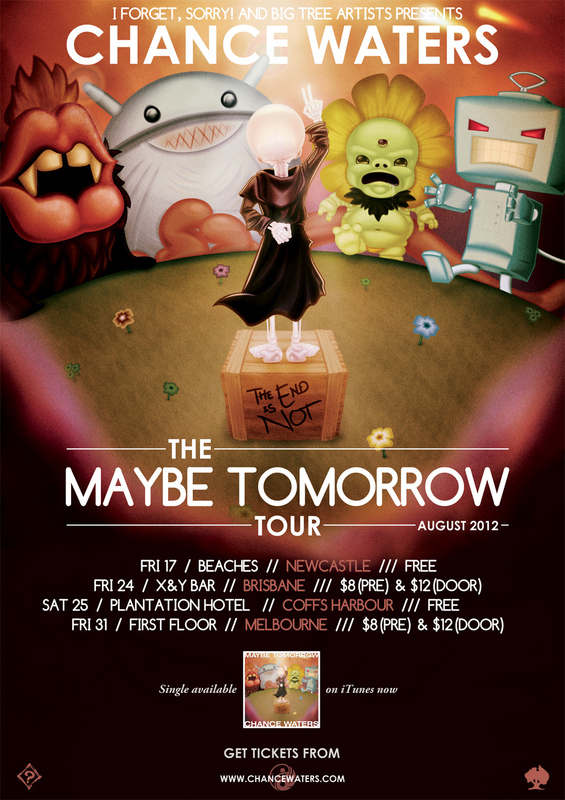 Maybe Tomorrow was added to rotation on triple j, and subsequently multiple stations nationally. Upon its release the single flew to #9 on the Most Added National Radio chart and #4 on the Most Added Alternative National Radio chart. These achievements assisted Maybe Tomorrow to reach the latest height of #30 on the iTunes Hip Hop chart. In its 2 weeks in the AIR Radio Charts the single attained the highest spot of #11 and #2 on the Independent Distribution Chart. On the event of Maybe Tomorrow receiving more than 20,000 track streams on Youtube, Chance released his video clip for the song which will no doubt hit a similar height. Also on Youtube, Chance’s remix of Gotye’s international hit Somebody That I Used To Know has broken the overwhelming 150,000 views mark, and his previous single Infinity has hit almost 24,000 views. Recently the song has been synced to National Geographic’s trailer for its new series Doomsday Preppers which documents the day-to-day lives of people preparing for the end of the world. The trailer is currently playing to an international audience on National Geographic worldwide. This tour is a chance for fans to catch the innovative Chance Waters headline shows for the first time along the east coast. Interview || Twitter || Facebook || I, Forget Sorry!